Usually OpenCart 2.x extensions come packed in a zip, which contains installation and/or update instructions, sometimes a release log and another zip, whose name ends in “.ocmod.zip“. 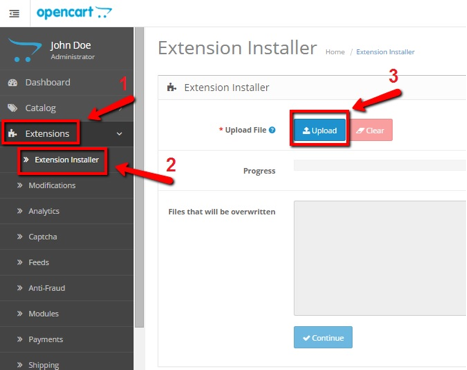 Extension Installer recognizes such zips and uploads their content directly to the FTP root of your store. That said, it will produce an error if you try to upload zips with a name that is not in the “*.ocmod.zip” format. 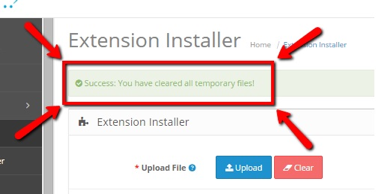 In order to upload an extension, navigate to Extensions -> Extension Installer. Then click the blue Upload button and provide the route to your extension’ s”*.ocmod.zip” archive. If the extension that you are installing contains files with names already existent in the current location, you will receive an alert about this in the grey “Files that will be overwritten” box. This means the extension is about to overwrite files that you already have on your site. Here, you can either inspect all of the listed files and make sure no OpenCart core files are to be overwritten, or contact the extension’s developer directly. Once you are sure it is safe to proceed, click the blue Continue button. On success, you should get a green “Success: You have installed your extension!” message. Uploading single .xml modification files is just as easy as installing zip-packed extensions. The difference is only in the route you will provide the Installer with. Modification files’ names should end in “.ocmod.xml” when uploaded via the Installer. When this happens, files that had already been uploaded before the error has occurred, will need to be cleared. OpenCart has the red Clear button for that. If you had forgotten to do that, you will also get an alert on the top of the page about this every time you access your Extension Installer. You should always make sure all temporary files are cleared before uploading an extension or a modification file because at the very least, they will be taking up space on your server. Once Extension is successfully installed. give a user permission by following below article. 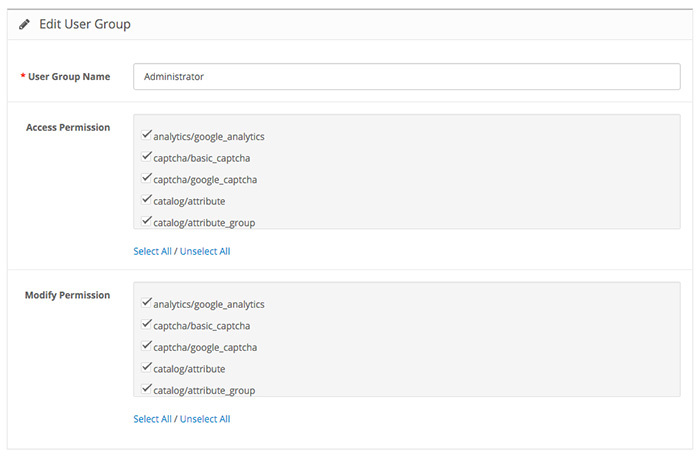 In the User Groups section, you can create groups and determine which admin pages can be viewed and modified by each group. Note that you must know which pages can be accessed or modified with the Access and Modify permissions. 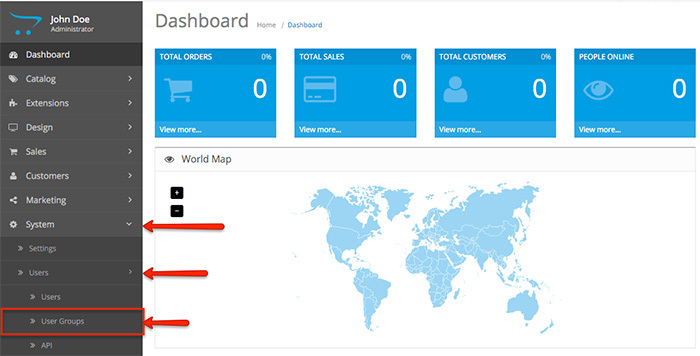 You have two pre-defined user groups in your default installation – Administrator and Demonstration. While the Administrator group has all the permissions, the Demonstration group has none. You can delete both of these groups and create new ones. Click on the Action button for one of the user groups to see the permission fields. The Edit User Group section gives you two main fields – Access Permission and Modify Permission. Respectively, the Administrator user group has all the access and modifying permissions. However, users assigned to the Demonstration group will have no permissions to access or modify any of the Admin panel pages.